Image via Carolyn Kaster/Associated Press. Do you know who has been so dramatic lately? And by “lately,” I mean since at least his senior year of high school? Here’s a hint: he’s got tiny little eyes and loves the word “abortifacient”! 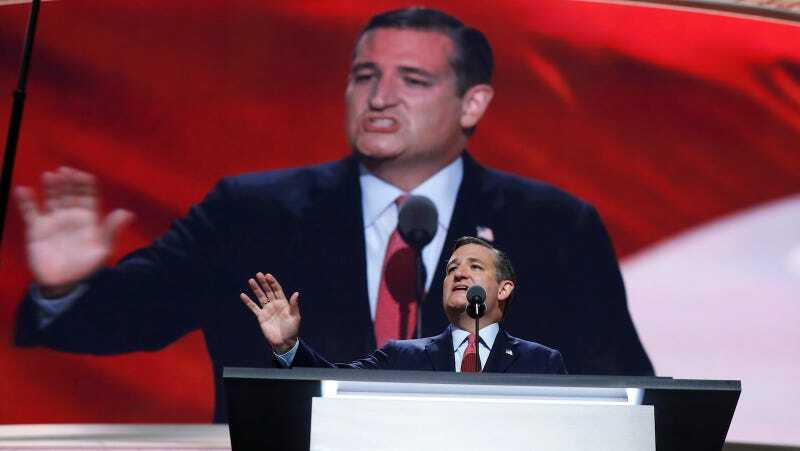 Recently, Sen. Ted Cruz endorsed Donald Trump for president, even though Donald Trump trampled over the family Ted Cruz claims to hold dear, insinuating that his wife Heidi has evil secrets and is not hot and that his father was involved in the assassination of John F. Kennedy. Anyway, now he is! But it was really hard, folks. “Agonizing,” in fact. The Washington Post reports that in a public sit-down at the Texas Tribune Festival, Cruz credited the “voices of the grass roots”—i.e. the people who booed him at the RNC—with changing his superior mind. These individuals, according to Cruz, possess the wisdom of a forest of ancient oaks, the diligence of an army of Spartan warriors, the emotional purity of Mary at the cross. One more point: Ted Cruz dropped out of the Republican primary in May. He endorsed Trump in September. What snow is he talking about?